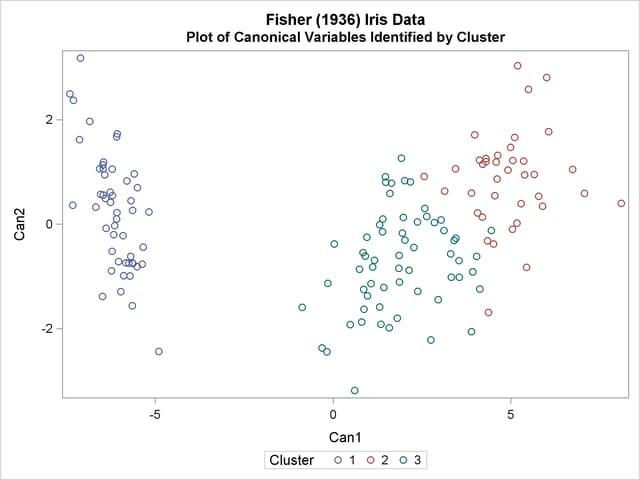 The iris data published by Fisher (1936) have been widely used for examples in discriminant analysis and cluster analysis. The sepal length, sepal width, petal length, and petal width are measured in millimeters on 50 iris specimens from each of three species, Iris setosa, I. versicolor, and I. virginica. Mezzich and Solomon (1980) discuss a variety of cluster analysis of the iris data. In this example, the FASTCLUS procedure is used to find two and then three clusters. In the following code, an output data set is created, and PROC FREQ is invoked to compare the clusters with the species classification. See Output 35.1.1 and Output 35.1.2 for these results. For three clusters, you can use the CANDISC procedure to compute canonical variables for plotting the clusters. See Output 35.1.3 and Output 35.1.4 for the results.